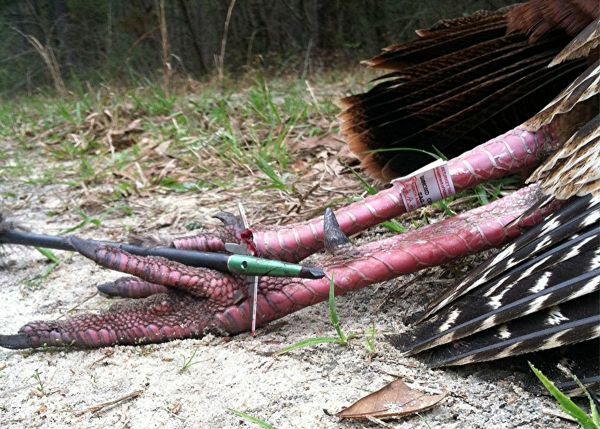 Don't discount your chances of taking a Carolinas turkey with archery equipment. It might be tough, but follow this long-time hunter's tips and you might tag a tom with a broadhead and bow. Hammond just smiles, holds up his bow and heads for his truck. His explanation is that he has been more than blessed with hunting opportunities and has taken more than his share of wild turkeys with firearms. Using a stick and a string to tackle turkey takes a lot more planning than walking into the woods with a shotgun slung over your shoulder. Because it’s tough to conceal the movement involved in drawing his bow, Hammond must scout how and where birds move on the land he intends to hunt and pattern them almost to the exact steps they’ll be taking. “I’ll pattern my turkeys early and get to know their travel movements, because the first week or two of the season is when those gobblers are still henned up and with large packs of hens, (and) they will stick to the same travel pattern throughout the day,” he said. Other than archery tackle, Hammond heavily relies on two pieces of gear to help him get close enough to a gobbler to take a shot. The first is a blind, which may be of permanent construction involving natural materials or a pop-up blind he carries into the woods the morning of the hunt — or possibly the night before. Hammond prefers — especially early in the season when birds are ganged up in flocks — is similar to the way he hunts deer in the fall. He gets into a stand before daylight, and that’s where he hunts for most of the day. “If I am very confident the turkeys are coming through this area, if I’ve done my homework and ... I know the preferred travel routes, I’ll sit four or five hours in a blind, just lightly calling every 15 to 30 minutes,” he said. The second piece of gear is a decoy. While he may be certain a gobbler is going to travel this way, very few “certainties” exist in turkey hunting, so he uses the power of suggestion by deploying rubber social media. Hammond uses the same bow for turkeys and deer, and he makes very few adjustments, right down to using the same broadhead. “If you’re shooting 70-pound draw weight at deer, I recommend backing it down a bit; anything over 45 pounds is sufficient” he said. “Having enough kinetic energy is not going to be an issue on turkey. You never know how long you might be stuck at full draw before he gives you a good shot, so you don’t want to be straining against all that draw. Gobblers are very tough birds, but you’re not going to have a problem with penetration. For all the debate over which broadhead to use for turkey, Hammond also sticks to the same brand and model he uses during deer season.